We have recently had the chance to work with The God Puzzle by Valerie Ackermann. This book, subtitled How the Bible Fits Together to Reveal God as Your Greatest Treasure!, is intended for kids ages 7-12. I had kids ages 7, 9 and 12 when we got it (and ages 7, 9 and 13 now) so we worked through it together. 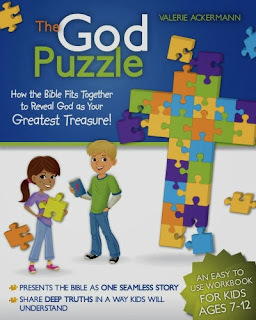 The God Puzzle is a colorful, easy to use tool to help you communicate to your child the rich truths about God, His ways, His will and His love. The God Puzzle will help you address doctrinal themes of the Christian faith in a kid friendly way, present Bible lessons in an interactive way that will hold the child's attention and deliver quality teaching with no preparation needed. 75% of children leave the church when they leave home. Something isn't working. Sunday School isn't doing it all. Kids need answers, good ones. And they need them from you, the parent. This book enables you to give them simple, clear answers. One really cool thing about this is that there really is no prep time needed. Grab the book, a Bible, and something to write with. That's it -- you are ready to begin. That is a huge plus to me! Each lesson (there are 36 of them) is split up with puzzle-piece dividers, so you can sit down and do an entire lesson (a half-hour or so), or just a section or two. Love that flexibility. The language is kid-friendly, as are the concepts. And it is written in actual English instead of something from a few hundred years ago that I struggle to understand. This is all presented as one big story, not a lot of individual things that really don't relate to each other. Lesson 1 starts with creation, and lesson 36 (I peeked ahead, we're not that far!) deals with the world to come. In between, it is a single narrative. My thoughts: There is a lot too much looking up Bible verses for my daughter (the 7 year old), and the 12/13 year old seemed to think he was way too grown up for this. I think to finish it off, I'm going to be letting him drop out, and I'll be doing most of the verse-looking-up parts myself. My kids think it is good (and Trina loves the drawing parts!) but to some extent, they have this jaded "I know this already" attitude going too. So if your young ones are already very familiar with the Bible, this may not be enough. However, I still think they are learning from it, just not necessarily the "Bible story" part. More of the "how does this apply to life" part.